"Freude, schoener Goetterfunken, Tochter aus Elysium." Few pieces are beloved as the symphonies of Ludwig van Beethoven, and the Ninth Symphony is clearly the pinnacle of the classical symphony. Herbert von Karajan, during the 1980's, felt it important to preserve his interpretations on home video. This DVD is a re-release of the laserdisc which was issued about 1990 by Telemondial. The performance itself is quite delightful. There are a few brief quickenings of tempo that I'm not sure that I agree with, but overall von Karajan gives an energetic and stimulating reading of a familiar text. The soloists, while not major names, are quite capable and deliver a substantial but not overwhelming performance. Beethoven was quite clear that his repeats were not meant to be disregarded in even his most trivial music. Von Karajan does not, unfortunately, take the indicated repeats in the second movement, which is really the sole significant fault of the performance; it would have rated a solid "A" if the repeats had been taken as written. Image Transfer Review: The color scheme of this entire series of von Karajan performances is intentionally muted. One would think that the picture is washed out, until we see a close-up of one of the violins, and it fairly glows a vibrant reddish brown. Clearly von Karajan intended that the picture not distract from the music, which is quite appropriate. The camera changes position quite frequently, so we do not get a static feeling to the performance. The picture is focused solely on the conductor, the orchestra and the vocalists; no other images intrude to interrupt the quality of being at a concert. While not flashy by any means, the image certainly accomplishes what it sets out to do. Audio Transfer Review: At first, the sound of the DD 5.1 mix appeared slightly bright and irritating, with insufficient low midrange sound (about in the cello range). It reminded me of the sound that was heard on early CD's, where careful attention was not paid to the mix. However, by checking out the speakers it became apparent that this portion of the range had been assigned to the rear surrounds. When I moved about five feet behind the usual sweet spot, the sound was more acceptable. This imaging should have been done on the DVD, however, and is a serious fault of the mastering. Once this defect is taken into account, the directionality is assertive but not obnoxious. The main difficulty is an unfortunately overwhelming emphasis on the timpani, especially in the first two movements. While the timpani plays a vital role (of course most notably in the 2nd movement), it is just too loud for proper balance with the rest of the orchestral forces. This is worst in extended loud rolls, such as in the first movement at 16m:27s or the climax before the coda in the second movement: the timpani actually manages to drown out the entire rest of the orchestra playing fortissimo. At these points, the work briefly degenerates into a muddy mess. The third movement (largely timpani-free) stands out in particular as a beautiful reading; the sounds are transparent and crystal clear; every movement in each section can be followed easily. The PCM stereo track sounds rather thinner than the 5.1 mix, but the timpani is in a proper balance. The sound is a little distorted in the second movement on the PCM track. However, it is far preferable to the DD 5.1 track, which can only be deemed faulty. I would give the 5.1 track an "F"; the grade given is for the PCM track only. 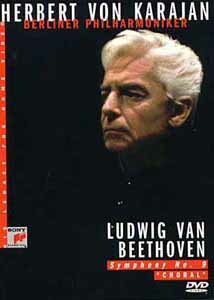 Extras Review: There are some scanty notes on the symphony, and a slightly more extensive biography of von Karajan. The chaptering is unfortunately thin; it would have been nice to go directly to the various segments of the Finale, or to the Trio of the Scherzo. While the box states that the program is presented in English, German and French, that applies only to the bio and the notes on the symphony; the symphony is sung only in the original German. What could have been an excellent beginning to Sony Classical's issue of the Beethoven symphonies is unfortunately rather spoiled by a botched 5.1 mix. The PCM track is recommended; if you do listen to the 5.1 track be sure to sit closer to the surrounds than you would ordinarily.